Can you imagine a time when "neighborhood sushi bar" was a phrase as strange as "The Internet" or "smart phone"? It wasn't that long ago when most of the American public considered the eating of sushi downright exotic and uncivilized, akin to stories of tribal cannibalism and that scene from Temple of Doom with the monkey brains. "Only those crazy Asians would eat fish raw!" they'd say. Now look. Sushi is everywhere: in supermarket deli cases, cruise ships, and yes, practically every corner in America--even in Wichita, Kansas, where I once had sushi despite being in a place where the closest ocean was a three-hour plane ride away. Kotobuki in Laguna Hills is one of those neighborhood sushi bars that reminds me how far along we've come in embracing sushi into our stomachs and our culture. It was recommended to me by a friend who was not Asian and when I ate there there were no Asian faces anywhere in the restaurant except those of the people who were cutting the fish. It's been around 25 years, not exactly in this spot, but a few yards away in the same plaza that also has Break of Dawn. The landlord relocated both of them to their present spot a few months ago to make way for apartments. And here Kotobuki will stay for probably another 25 or until its head sushi chef and owner decides it's time to hang up the knives. Because of the lack of actual Japanese customers present, I wrongly assumed that Kotobuki is the kind of place that one wouldn't expect omakase to be offered. So when I asked if they did it, I half expected them to say no. Except he said "of course", in a way that kind of made me feel a bit silly for even doubting. What followed was an omakase meal that was balanced between the cooked dishes they offered (such as the butter-sautéed asparagus, mussels broiled with mayo, fried fish scraps, stir-fried mushrooms) with the raw (various cuts of nigiri sushi, sashimi drenched with ponzu, hand rolls stuffed with salmon skin, and a cut roll)--for about $70 for two, a reasonable amount. Kotobuki may not use too exotic an array of fish, sticking mostly with the tried-and-true tunas and salmon, and they can often rely too heavily on lemon and ponzu for flavoring; but the cuts are precise and generous, the chefs are chummy, and the service obsequious. And when you toast their "Awesome Sushi" (which is a motto they themselves coined for themselves and made t-shirts for) it will be with Kirin, Asahi, or Sapporo, the trinity of Japanese beers that's as common to America these days as Bud Light--and it's all thanks to neighborhood sushi joints like Kotobuki--purveyors of assimilation as well as sushi. 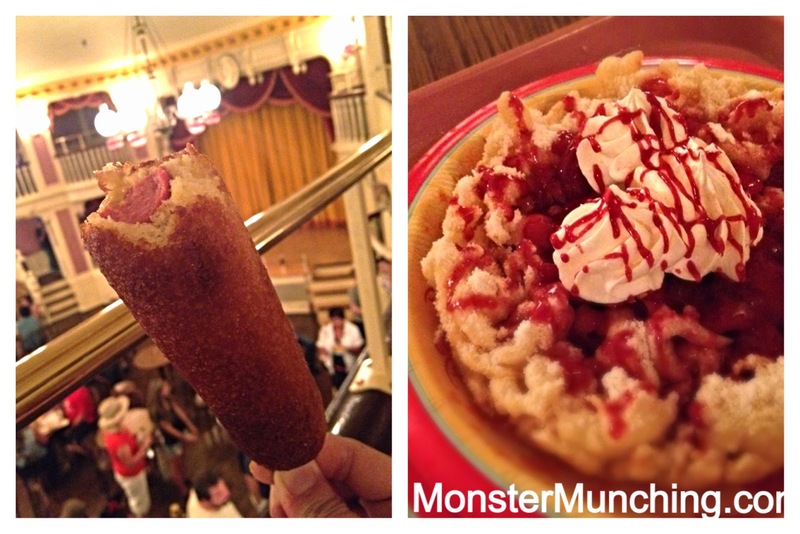 You may think the only place at Disneyland that serves those perfectly fried and decadent corn dogs is the red truck parked at the end of Main Street. The Stage Door Cafe is probably the better venue, not because the corn dogs are any more decadent, but because they serve it with actual fries, not just chips. 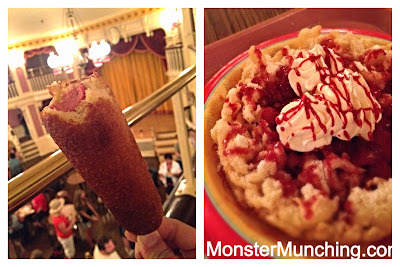 And even better, Stage Door is the one place in the Magic Kingdom that makes hot, crispy funnel cakes--and in three variants, no less. So if you're looking to get your fill of all the deep fried theme park food in one place and at one time, this is your Mecca. And here's a tip: once you've gotten your haul, bring it into the Golden Horseshoe, go upstairs, then eat it in the air-conditioned mezzanine while looking over the tourist ribble-rabble below you. Pizza Rev is the umpteenth build-you-own-pizza restaurant to open in OC. And there are no signs it will be the last. As similar as it is to the others we've seen before, it still attracts a crowd--proof that the market is not quite yet saturated. But if they're all going to be as well-managed and as tasty as Pizza Rev is, then let them come, I say. The ritual is the same. You get in a line. You pick the sauce. Sauce gets swirled on a flattened dough disc. You pick the cheese. Cheese gets spread on top. Then as you walk with your pizza down the assembly line, other employees put on as much meat (everything from anchovies to spicy chorizo), and as much veggies (everything from artichoke hearts to spinach) as you want. Finally, it's whisked off and then slid into the blistering floor of a dome oven. You find a seat somewhere. The pizza comes out hot, delivered on a pie tin. No matter how many toppings you managed to pile onto it, you paid the same price as everyone else--$8. But since all the meats are pre-cooked, you could conceivably make one hell of a meaty entrée salad, which is actually my favorite thing to do here. Bacon, chicken, blue cheese--that's what I load mine up with...everything that makes a Cobb great minus the hard-boiled egg. 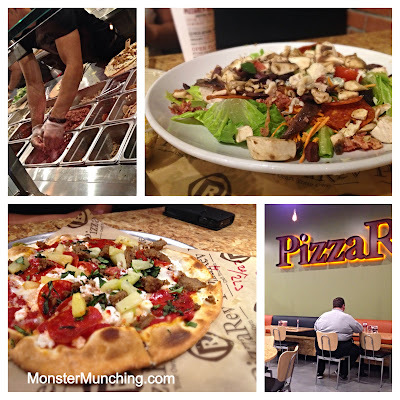 Now, it's true that I could patronize similar concepts that do salads instead of pizza. They would have hard-boiled eggs for sure...but care to take a guess why build-you-own-salad joints aren't popping up all over like a disease? Because even if you just want a salad, you still want the possibility of pizza. Like all things in Cars Land, Cozy Cone Motel looks exactly like the movie. But that's not what it makes it special. 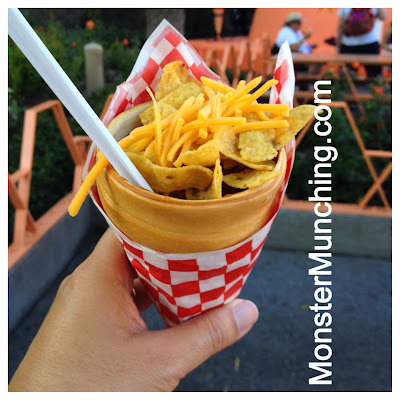 In about four or five separate traffic cone-shaped buildings, Cozy Cone Motel serves its food all in cones. I mean everything. We're talking ice cream cones, popcorn in a cone, churros in a cone. You get the idea. And it's not just a gimmick. The point is that you can walk, talk, or stand in line for Radiator Springs Racers and still eat what you buy here. The best cone meal of all is the Chili Cone Queso, a dish that's as fun as it sounds. It's basically thick beef chili, poured into a sturdy, leak-proof, hand-holdable cone made out bread (think of something between a pretzel and breadstick) that's topped with grated cheese and Fritos. At first, you eat it like a stew with a spoon; then you eat the rest like an ice cream cone, leaving nothing behind. It's the next evolutionary step after those ubiquitous clam chowder bread bowls and it's way more delicious. The idea is simple, but ingenious. Take a small rectangle of yellow cake. On top of this, add a whole strawberry suspended in whipped cream. Then, sculpt it into a dome covered in a thin, chewy layer of mochi. What do you get? The best dessert revelation I've had since Cream Pan's Strawberry Croissant. J. Sweet Bakery makes it, sells it in cute little pink trays. 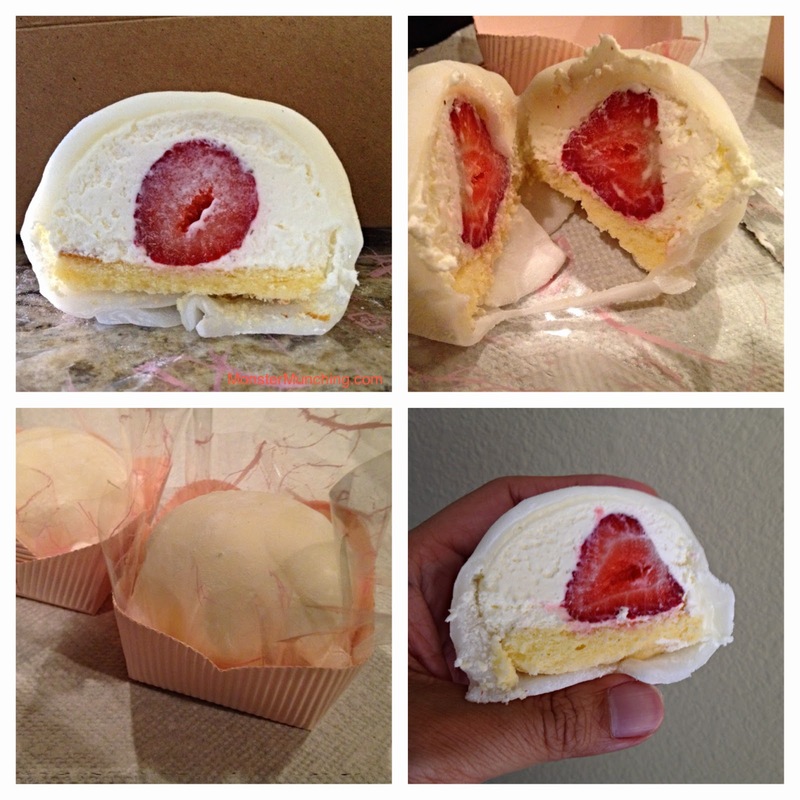 And it's as decadent as the hand-holdable strawberry shortcake that it is. But it's also the sexiest dessert you'll ever have. It's all because of the mochi, which has the supple consistency of nibbling on a lover's ear lobe, their lips, and other body parts. Let me put it this way: You remember the infamous scene from 9 1/2 Weeks? You know the one. It's the only scene anyone actually remembers from that movie. With Mickey Rourke feeding strawberries to Kim Basinger's lips? J. Sweet's Strawberry Mochi is that entire scene condensed into a foodstuff you can buy for about $3.